The state, under the McCrory administration, initiated the reclassification of part of the Lower Cape Fear River (LCFR) from Tidal Salt Waters to Swamp Waters. The Environmental Management Commission, responsible for adopting rules such as this, supported the reclassification and sent it to EPA for final approval. 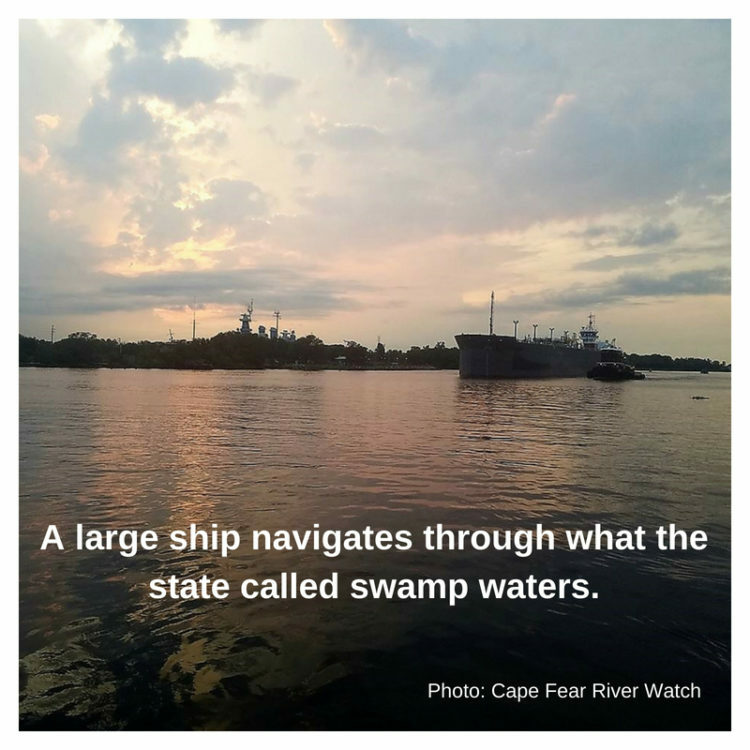 The Southern Environmental Law Center (SELC) was prepared to file suit on behalf of Cape Fear River Watch, if the reclassification was accepted. The request claimed that ‘natural conditions’ led to excess nutrients in the water, which has been designated as ‘impaired’ since 1998. The LCFR is designated as an “Anadromous Fish Spawning Area” supporting populations of striped bass, American shad and two endangered species of sturgeon, and as a “Primary Nursery Area” – entitled to a higher level of protection due to its vital role in supporting a healthy fish population. But, instead of forcing the multi-billion dollar industrial farming industry to clean up their waste management practices, the state decided it was easier to just change the water quality standards to those of Swamp waters, so they could meet the requirements for that classification. But, it turns out the EPA drained all logic from this irrational request stating “… the requirements of the CWA [Clean Water Act] and 40 CFR [Code of Federal Regulations], Part 131 have not been met.” For one, EPA said the state did not provide proof that the water met the criteria to define it as a swamp – based on velocity and other swampy things. And two, the state did not provide any evidence that the water quality parameters of a swamp could protect the organisms living in the river, including endangered sturgeon. SELC said in a comment submitted in 2016 that dissolved oxygen levels below the currently required 5.0 mg/L would pose a threat to sturgeon in the river. “This statement, which speaks to both the presence of sturgeon and their habitat requirements, serves to further highlight that identifying this segment as swamp waters is inconsistent with both the common interpretation of swamp and the state’s own definition of swamp waters,” the EPA stated in their denial letter. Since it’s clear that the reclassification request ignored federal and state law, and ignored the scientific evidence proving that excess nutrients stemmed from industrial farming practices upstream, one might wonder how the Environmental Management Commission could have accepted the reclassification request. Fun fact: Environmental Management Commission members are appointed by governors, and leaders of the NC house and senate; (many were appointed by the previous governor), and one member is a retired VP for Butterball – leader in industrial turkey factory ‘farming’ in NC. DEQ staff will advise the EMC, at their upcoming September 12-13 meeting to accept EPA’s decision and take no further action on the matter. Congratulations River Watchers — now, we won’t have to call you Swamp Watchers! Chemours wants to be a good neighbor – so, they said.